I am not even sure whose idea it was to be honest and I don’t ever remember signing up for this when we moved out here. 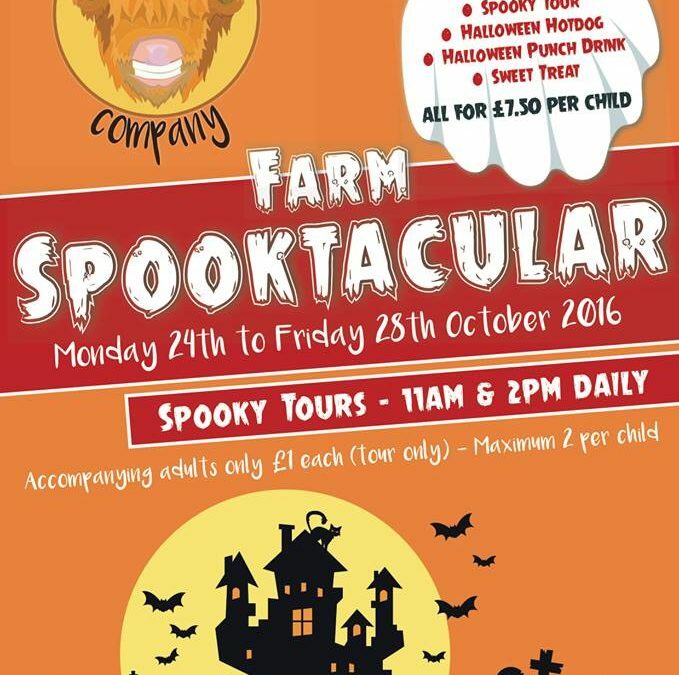 What I had thought was a bit of a throw away comment from somebody, very soon snowballed into what is now our ‘Halloween Spooktacular’. All half term week we’ve been running a fun event where kids can take part in various activities and with hotdogs and refreshments thrown in. The place is awash with spider cookies, pumpkin treats, toffee apples and ghostly cupcakes. On top of all that, visitors can go on the farm trail with ‘Sheriff Shaun’. I swear, the things I get roped into. I wouldn’t mind but I don’t even have my own sheriff badge, I’ve had to borrow one from one of my grandsons, Noah. Let me explain the context of how these trails works. Imagine that you are a child aged under 12 and you are assisting the sheriff in apprehending the bad guy, ‘Rustlin Rodriguez’, who has been stealing our sheep. All the way around the farm we enlist the help of all the animals, our resident witch who lives in the wood and Sarah the hairy legged spider to catch the bandit. All the while the kids are searching for the bad guy, who keeps popping out from behind trees and disappearing again, all very pantomime like. It does seem to be going down really well with the kids, even if I do have to dress up like a complete muppet! I will shortly have a decision to make and to most people this wouldn’t be a hard decision to make at all. You see, we have hundreds of trees and as the leaves are starting to drop already, I need to decide whether to collect them up, or do I just leave them to be taken wherever they might by the wind. The thing is though that although we have been here for more than two-and-a-half years, I think about our past life, when I would meticulously shift every leaf that fell, so as to keep the place looking tidy. Thinking about being that tidy over eight acres of land would be a complete nightmare, but at the same time it is already driving my OCDs bananas, so I will have to make a decision soon. There has been lots of clearing out to do around the vegetable patch this last week. Emptying beds and turning the soil over ahead of winter, making sure it all looks tidy before any bad weather kicks in over the coming weeks. I have been reminded this week of some unusual behaviour with regards to our sheep. I don’t think it’s a characteristic which is seen only in Shetland sheep, but I would be interested to find out. Although it doesn’t happen with the whole flock, it does happen with several of them and we have seen it many times before and I noticed it this week with our new ram ‘Mac’.